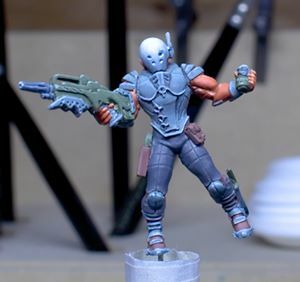 Ahh, the second week of painting my Infinity Nomad Intruder. I am slowly getting back into practice and although the siren song of Dota II had it’s normal effect on me I was able to resist enough to paint. I’m starting this post on Monday and already I am off to both a good and bad start. The good start is that I painted. The bad news is that once I had finished my first colour I wasn’t in the mood to clear my palette for the next. Instead I called it a night. I’m not going to bother photographing what I painted. It’s not worth it. However, that does mean there is one less colour left, which I think is better than nothing. Hopefully tomorrow brings better results. Tuesday brought snow and so I spent the evening swapping tires with insufficient tools. There are few things worse than trying to work without the right tools. I didn’t have it too bad. I had tools designed for changing tires. My problem was that they were designed for changing a single tire in an emergency and so they favoured compact simplicity over utility. Even just a proper car jack would be nice. This spring I will be investing in proper chalks to immobilize my car and a proper jack. Needless to say I was not physically up for painting after that. All the hardware, kneepads and various grey-blue items are finished. Tonight I had no excuse. I even worked from home on account of the snow. Oh well, at least my tires are on for tomorrow I guess. So I trundled downstairs to watch youtube and paint. I don’t really understand the point of youtube painting videos that show advanced drybrushing. There’s a school of painting that teaches very basic techniques as if they weren’t very basic techniques. It’s like when you see someone being honestly racist in person. Isn’t it 2013, aren’t we better than that yet? These are Artizan or Crusader or Bolt Action (or a mix of). I painted then in a quick army-painter style and I’m reminding myself that they look good. Oh yes, army painting. Maybe a little darker in the shadows and they’d be perfect. On the upside I may be finished tomorrow. All that’s left are the pants and maybe the stripe on the helmet if I decide to paint it. Done, more or less. I wasn’t sure I wanted to mess around with a stripe, and there was some orange detail in the back of the helmet. In the end I decided to try a glowing orange eye. It really didn’t work. Ouch. All finished except for final varnish and the base. I was actually pretty happy with my progress on the legs. It’s just a matter of putting on the highlight and shade where they belong and then giving some quick glazes with an intermediate colour to pull them together. If I wanted to I could have spent more time but I wanted to get this finished. I struggled a little lining in the share highlights and seam details. It reminded me of a lesson I learnt perfecting my speed army painting skills. I wrote a post about it. No Nerdnight tomorrow so hopefully I’ll get a chance to knock together a base and paint it. All I managed this weekend was to build a simple base on prime it. I also finished painting the Zond’s base and attached it. I’ll have pictures of that for next week. I’ve been fighting a cold this weekend so haven’t had the energy for much modelling. 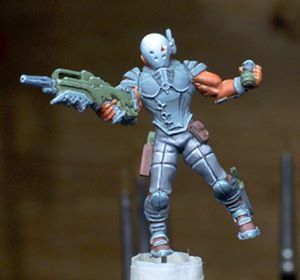 Not sure if I’m going to start another Infinity miniature or return to my War of 1812 project. I feel like practicing some army painting techniques would be advantageous once I start on Deadzone.